“The Helium Table” soon progressed into a series of helium-themed children’s books, aptly called The Helium Books. (The series has three books to date, with the latest published in 2012.) 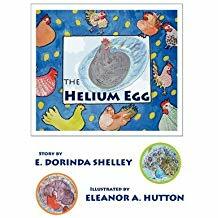 Illustrated by Eleanor A. Hutton, the story is about the barn animals having to deal with a strange phenomenon: a very large blue egg that expands and floats upwards and later hatches into several baby ghosts, later adopted by a black hen. Order E. Dorinda Shelley’s “The Helium Egg” today through Amazon and Barnes & Noble. Dr. Shelley is a retired dermatologist. She grew up in Missouri, spending weekends on a farm with friendly horses. She, her husband, and three children lived for many years on a “farmette” in NW Ohio, surrounded by many of the animals in the Helium Books. This is the second in a series of books she has written and Eleanor Hutton has illustrated.